E-mails are one of the most important ways of communicating online. And your first e-mail to a prospective business client or a date really leaves a mark on them if you have something different in your e-mail. Setting a signature image in your email that shows the current season (Summer, winter, spring) that is going on is really a good idea. In this article we will show you how to easily match your Windows Live Hotmail signature with the ongoing season. 1. Log in to your Windows Live Hotmail Inbox. 2. Select “ Options ” on the top right under your name and then select “ More Options ” at the bottom of the menu that appears. Check the image (Img. 1) on the right for clarifications. 3. 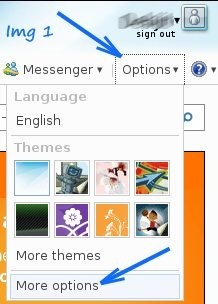 Now click on “ Personal E-mail Signature ” which can be found under the Customize Your Mail section on the Options page. 4. Now select the HTML mode from the text-format menu. 5. Now copy the code corresponding to the Signature Images shown below, and paste it in the signature area. 6. Then click “ Save ”, and your new signature badge will appear at the bottom of your e-mails!